Chinese Foreign Minister Wang Yi (R) shakes hands with Myanmar's Minister of the Office of the State Counsellor Kyaw Tint Swe at the Diaoyutai State Guesthouse in Beijing (June 28, 2018). Can Myanmar Afford China’s Belt and Road? Myanmar’s government is hungry for the investment boost, but the costs must be weighed as well. 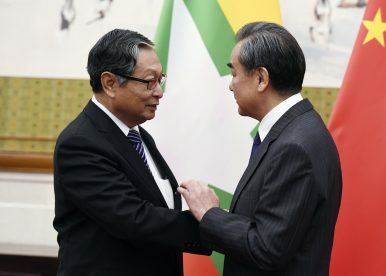 Two years after the Belt and Road Summit in Beijing, Myanmar seems ready to be integrated into Beijing’s Belt and Road Initiative via the China-Myanmar Economic Corridor (CMEC) — despite criticisms and concern over a potential debt trap. A 1,700-plus kilometer corridor stretching from Kunming, the capital of Yunnan province in China, to the seaport at Kyaukpyu in Myanmar’s Rakhine state, CMEC will be one of the largest single packages of foreign direct investment in Myanmar in decades, and the government in Naypyitaw is anticipating a quick economic lift. Ranging from trade to technology, China and Myanmar’s Pauk Phaw (fraternal) relationship is advancing. A drafted but delayed Memorandum of Understanding (MoU) is expected to be signed in the upcoming weeks and will become the first agreement to be inked by the newly appointed minister of planning and finance. Despite some concern over the affordability, the initial proposal incorporates over 20 projects as early harvest projects within CMEC for an estimated budget of $2 billion. The Ministry of Agriculture, Livestock, and Irrigation took the largest slice of the pie, with $400 million planned for upgrading irrigation systems. The total estimated budget of $2 billion, however, does not include the cost of major infrastructure projects to be implemented by the Ministry of Construction and Ministry of Transportation and Communication. Three major road upgrade projects, the construction and renovation of airports, and the development of inland port projects, are all planned without any feasibility studies and budget estimates to date. In drafting the proposal, these projects seem to have a political green light from the cabinet, but so far there has not been much debate over or attention paid to these initiative. The biggest concern is how to finance the infrastructure development. New cities, industrial parks, business districts, resorts, and urban development projects have also been proposed by private sector entities as Private Priority Projects related to CMEC. New Yangon City Development is one highlight of these proposals; the MoU between China Communications Construction Company (CCCC) is expected to be signed in the coming months, though controversies remain. In addition to New Yangon City, the estimated budget for other Private Priority Projects under CMEC is more than $100 billion. Major cities like Mandalay and Muse, some of these proposed project sites, are beyond the primary CMEC area, hinting that the project could be extended toward Irrawaddy regions, the rice bowl of Myanmar. Pathein (Bassein), once a colonial port, is now being thrown in the mix again in the context of development, and Pathein Industrial City could become an additional seaport to supplement China’s strategic investment in Kyaukpyu. As of now, all of these projects to be integrated into CMEC are still only drafted on paper. Negotiations are still in the initial stage and require significant further deliberation, especially on financing. Rising concerns over Chinese megaprojects under the BRI and the potential risks of a debt trap continue to make headlines in the region, and Myanmar is no exception. Mitigating financial risk by investing land as a kind of equity for the projects is a feasible and attractive option for the administration, but not a popular choice with the public. The renegotiation of the equity ratio for Kyaukpyu and ongoing negotiations over New Yangon City have contributed to anti-Chinese sentiment among the local population. Taking a financial risk or offering long-term land leasing would open another can of worms. While Naypyitaw has proposed a series of hit-or-miss projects without strategic planning and transparency, Beijing’s has clear strategic priorities. The access to the Indian Ocean granted by the Kyaukpyu seaport project and infrastructure linking Rakhine state to Yunnan is still the top of Beijing’s checklist. That route, however, crosses two politically complex regions —northern Shan state and Kachin state. The CMEC corridor, which has in its plans the construction of a highway and highspeed railway, will run through multiethnic areas where existing interethnic and religious conflicts have contributed to instability in recent years. Conflicts along the China-Myanmar trade route in northern Shan state is a major obstacle to the realization of CMEC. Beijing likely understands that the viability of CMEC is closely tied with the restoration of peace and stability in Myanmar. China has been increasingly active in facilitating meetings between the government and members of the Federal Political Negotiation and Consultative Committee (FPNCC), a seven-member alliance of ethnic armed organizations situated in Kachin and northern Shan states. The intervention by China, with the goal of smoothing the way to implement CMEC, will likely have an impact on Myanmar’s peace process. Furthermore, social conflicts along CMEC and other investment areas have become discernible. Land issues and disputes between local communities and contractors are a common occurrence, but not the only obstacle to the project. The rise of inequality, weak strategic trade controls, and poor financial controls, among other things, also contribute to instability and risk escalating social conflicts in CMEC project areas. With Myanmar’s economy stagnating and FDI declining in 2018, CMEC presents an opportunity to initiate a flow of new investment and lift the economy. This view is widely shared among policymakers and development partners who have planned integration with CMEC, but many remain skeptical given concerns over the risk of a debt trap and the allocation of land as in-kind investment, which is unpopular among the public. Still in an early stage as of now, the realization of CMEC requires both political commitments and business agreements. The peace process and the impact of CMEC on local communities are critical determinants to the success of the effort to link Yunnan with the Indian Ocean via Myanmar. But it is still questionable whether Myanmar can afford the project, both in terms of financial as well as political capital. Amara Thiha is the Senior Research Manager at Myanmar Institute for Peace and Security (MIPS) and a nonresident fellow at the Stimson Center. The views and opinions expressed here do not necessarily reflect the policies or positions of MIPS and Stimson Center. Naypyidaw picks up the pace on the China-Myanmar Economic Corridor as other options for FDI fade away.